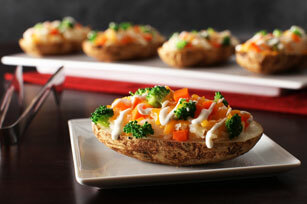 Baked potatoes move to the centre of the plate with these all-in-one stuffed potatoes. Made with vegetables and cheese and topped with a drizzle of dressing, these baked potatoes are stuffed full of flavour. Pierce potatoes in several places with fork or sharp knife. Microwave on HIGH 20 to 23 min. or until tender, turning after 12 min. Cut potatoes lengthwise in half; scoop out centres into medium bowl, leaving 1/4-inch-thick shells. Mash potatoes with milk. Stir in 3/4 cup cheese; spoon into potato shells. Microwave broccoli, carrots and water in microwaveable bowl 2 min. or until tender; drain. Spoon over potatoes. Sprinkle with remaining cheese; drizzle with dressing. Substitute your favourite vegetable or vegetable blend for the carrots and/or broccoli.